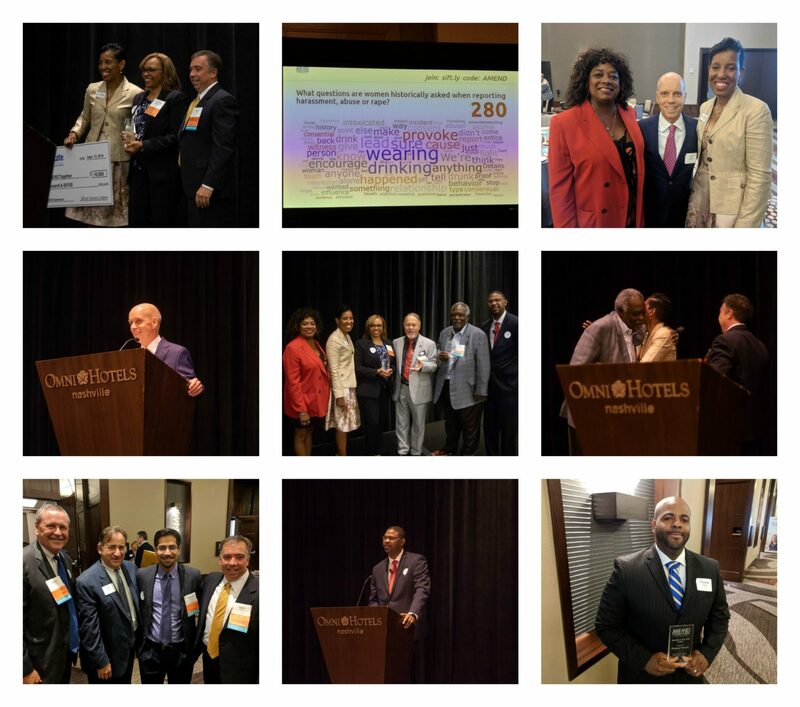 Images from the third annual AMEND Experience, featuring keynote speaker Scott Hamilton. NASHVILLE, Tenn. – More than 500 men and women came together Thursday morning at the Omni Nashville Hotel to confront a timely and critical issue —how to challenge a culture and end the epidemic of violence against women. The AMEND Experience spotlights the YWCA’s AMEND Together program, a primary prevention initiative dedicated to ending abuse against women and girls by engaging men and boys. The third annual event featured a powerful performance and testimony from Samford University student athlete and survivor Ruby Camille, education and training on recognizing domestic abuse and responding to the culture that supports it, and inspirational remarks from Olympic gold medalist and humanitarian Scott Hamilton. The most recognized male figure skater in the world shared personal stories from his career and urged the audience to get involved in AMEND Together. One in four women will be a victim of domestic violence in her lifetime, and 15.5 million children witness domestic abuse each year. Tennessee ranks 4th in the nation for the rate at which men kill women. Metro Nashville Police receive 26,000 domestic violence-related calls each year. The YWCA operates the largest domestic violence shelter in the state. The 51-bed Weaver Domestic Violence Center was housing 31 children and 26 women the morning of the AMEND Experience. Several area leaders were honored for their involvement with AMEND Together and the YWCA. Vanderbilt University Vice Chancellor and Athletics Director David Williams II was presented with the Collegiate Award for implementing AMEND training across the university’s athletics department and sponsoring numerous events. Director of Men’s Ministries for the General Commission for United Methodist Men Gilbert Hanke was honored with the Leadership Award for his long-time support and work on bringing AMENDing Through Faith curriculum to the religious community. MNPS teacher Thomas Francis of McKissack Middle School received the Teacher of the Year Award, and Allstate’s Cynthia Whitfield-Story was honored with the Macdonald-Negri Service Award. The AMEND Experience was sponsored by Bank of America, Nashville Predators, Allstate – Purple Purse Foundation, and Verizon. For more information, visit AMENDtogether.org. For 120 years, YWCA Nashville & Middle Tennessee has helped women, girls, and families in Nashville and Middle Tennessee build safer, more self-sufficient lives. YWCA is dedicated to eliminating racism, empowering women and promoting peace, justice, freedom and dignity for all. Programs include Domestic Violence Services, Girls Inc., AMEND Together, Dress for Success Nashville, and the Family Literacy Center. For more information, visit www.ywcanashville.com, follow us on twitter @YWCANashville and find us on Facebook facebook.com/YWCANashville.